Travel theme: Glow | Oh, the Places We See . . .
As I was reading the Knoxville News-Sentinel yesterday, I saw an article that immediately made a connection to Ailsa’s theme on Where’s My Backpack for this week’s challenge: Travel theme: Glow. In the Great Smoky Mountains every year, fireflies put on quite a show. It’s really the firefly known as Photinus carolinus, a species that flashes synchronously around the same time each summer. 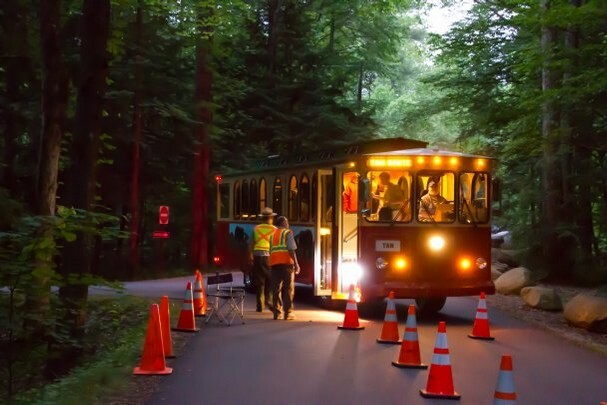 Because thousands want to watch this spectacle, the U. S. Park Service sets a time for viewing the “glow” at the Elkmont firefly event. Logistics: This year’s viewing is June 4 through June 11. You can board the shuttle to see this phenomenon at the Sugarlands Visitor Center near Gatlinburg, or, if you’re among the first 85 requesting a car pass ($1.50) at www.Recreation.gov for no more than 6 people on a particular day, you may be lucky enough to park and walk to the area. (The Park Service will hold back 85 passes for folks who don’t know they need one, but after those are gone, there will be no more issued.) Be sure to check this website for more information. Child enjoying the Elkmont firefly show. Photo from Knoxville News-Sentinel website. Etiquette: There’s even firefly show etiquette: people should cover their flashlights with red or blue cellophane so as not to impair people’s night vision. 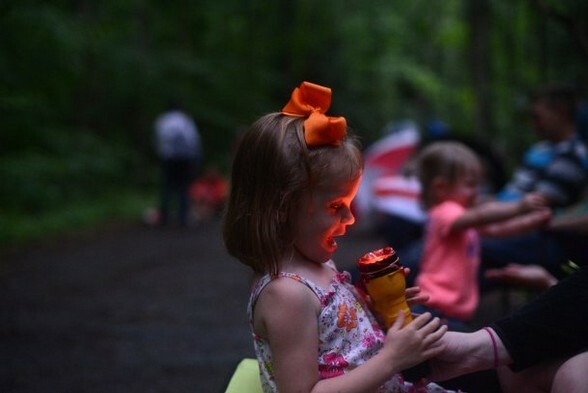 The fun of it: From what we’ve heard (we’ve never been), the firefly show is phenomenal: thousands of fireflies blinking their little lights in tandem producing one of nature’s best special effects. I’m hoping we can go this year. It’s a glow we’d like to bask in! For more entries into Travel theme: Glow, click here. I like the subjects for this one – especially the tram “glowing” up top. Thanks so much. I hope it was clear that I didn’t take this picture — it’s on the website of the Knoxville News-Sentinel. I just hope someday that I’m in that spot where the photographer stood so I can say I saw those fireflies, too! I’m hoping to get there – if not this year . . . someday. We used to catch them in the backyard using nothing but our hands. Put the fireflies in a canning jar with holes punched in the metal top. Good summer fun! A firefly is one of those bugs I really want to see! I love them, but I guess they could be considered quite pesky to those who don’t like bugs of any sort. They’re awfully fun to catch in the summertime in our backyard! I love the photo of the little girl. That is so wonderful. So true. We love to help our granddaughter catch lightning bugs but we’ve never used a flashlight. Might be something fun to try this year! Rusha, this just sounds like so much fun! I don’t think we have them in the Pacific Northwest…at least I’ve never seen one. Maybe it’s too cold and wet. Anyhow, I hope you will have the experience this year. It may be too cold where you live. But in the South, they begin in late May flashing in our backyards. It’s fun to watch. These just do the flashing all together. Hope to see that! Little kids even hold them in their hands. They’re not afraid of these — they just love the glow! Hope you get to the viewing, too! Thanks so much. If you were there, you’d have a close-up shot for us on your blog. I’ll probably just be lucky to see them at all. Thanks for posting!